The announcement said an “interim president” would be named later this month. Meanwhile, Dr. Ronald Brown, vice president for strategic planning, “will lead the day-to-day operations” of the institution, the statement said. Suber’s firing came on the heels of her announcement Friday that she was leaving at the end of May, ending a nearly 15-year stint as president of St. Augustine’s. Her decision to leave came after several weeks of disagreement with her subordinates over her strategy and pace for addressing the university’s financial problems, most of them stemming from a loss in enrollment and revenue. Before her announcement last Friday and the university board’s action on Monday, Suber had shaken up her management team, placing the university provost on leave and firing her vice president for business and finance. 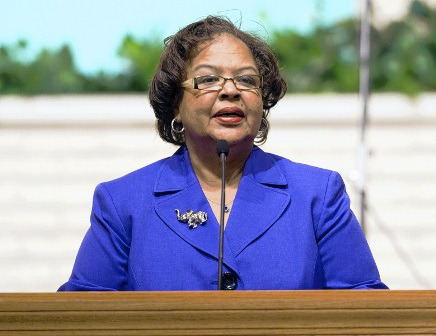 Before her firing, the university’s vice president for business and finance sent e-mails and related documents to members of the board of trustees to support her claim that Suber was mismanaging the institution and not cutting university expenses as needed, according to a report by the News & Observer, the daily morning paper serving the Raleigh area. Gaddy said the decision to terminate Suber was discussed by board members last Thursday and Friday in person and by phone. Without detailing his explanation, Gaddy said the challenges include the condition of the university’s finances and several investigations into its operations. One investigation, according to local press reports, involves a federal inquiry into a half-million-dollar federal grant the university received that is credited to a contractor who purportedly wrote the grant proposal but never signed an official contract for doing the work. There are also payroll questions raised by a 2013 audit. Suber, who could not be reached for comment Monday, has acknowledged for several months that St. Augustine’s was facing difficult fiscal times. She also acknowledged more recently that the university had received a negative audit for 2013, raising concerns about its finance and grant management. The News & Observer said its report on the negative audit “attracted the attention” of the Southern Association of Colleges and Schools Commission on Colleges (SACSCOC), the Atlanta-based college peer review organization. SACSCOC’s endorsement is considered essential to an institution’s ability to receive federal funds for student aid and other programs. In a March interview with Diverse , Suber said the institution has lost more than 200 students over the past two years, primarily due to a change to the Parent PLUS Loan (PPL) program, which provides loans to parents to help pay for their children’s education. For St. Augustine’s, those losses translated into approximately $4 million in anticipated federal revenue the institution never realized, Suber said. She said the university had raised about $1 million to replace the federal losses and was working on finding more, noting that the Presbyterian Church and other groups were helping. The rapid meltdown of Suber’s career at St. Augustine’s caps a series of “achievements,” the university said in its statement, beginning with her becoming the first woman president of the university 14 years ago. She was appointed to the White House Initiative Advisory on Historically Black Colleges and Universities. During her run as president, Suber helped the university keep 25 degree-granting programs in its five academic divisions despite increasingly tough economic times since the nation’s economy fell apart in 2008. In 2011, Suber marshaled the university’s successful efforts to gain SACSCOC “reaffirmation” of accreditation for another 10 years until 2021. Gaddy acknowledged St. Augustine’s faced tough competition in its search for Suber’s replacement. He said he knows several institutions that are on the hunt for new presidents, including several Historically Black Colleges and Universities (HBCUs). “The process will mean it will take a while to replace her,” Gaddy said.